At some point, we’ve all had our imaginations stirred by Spanish culture. From the intricate patterns of brightly-colored mosaics to a flamenco dancer clapping her castanets, there’s definitely something alluring. The blend of European and Middle Eastern influences throughout history has helped produce Spain’s unique cultural identity, which appears in literature, visual art, food, music, and architecture. Americans have been drawn to Spanish culture for a long time. Just ask the writer Ernest Hemingway! His 1926 novel The Sun Also Rises tells the story of American expatriates traveling in Pamplona to watch the bullfights. 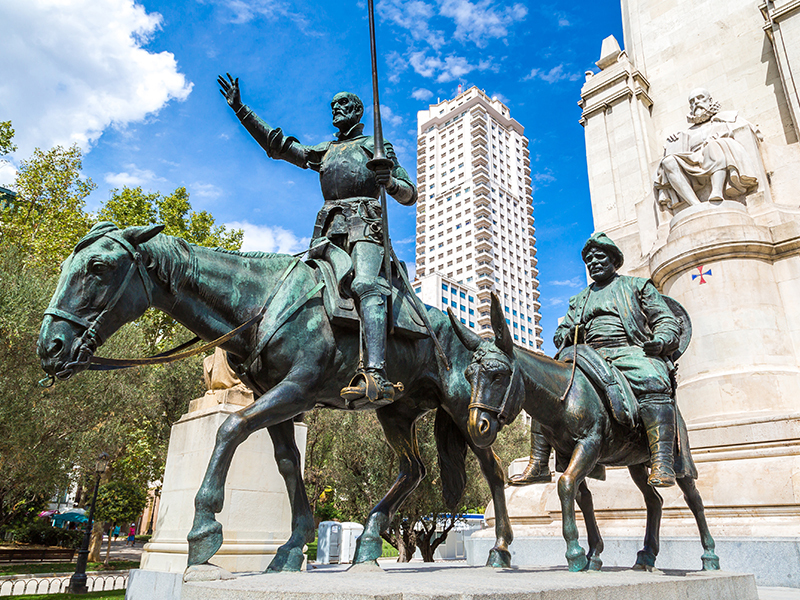 Even if you’re just now being introduced to Spanish culture, chances are you’ve heard of Don Quixote. This novel by Miquel de Cervantes tells the story of a fanciful knight and his down-to-earth squire, Sancho Panza. Lots of paintings and statues throughout Spain reference this pair’s comical adventures. Tapas, or small plates, are like appetizers or snacks. Some popular tapas include olives, meatballs, potatoes, calamares (fried squid), and cheese. Spanish people often munch on tapas before enjoying a late dinner (usually between 9 and 11 p.m.) or eat a few different small plates together as a meal. Spain is home to some really unique architecture, like the Sagrada Família in Barcelona. This fantastical cathedral was designed by the architect Antoni Gaudí, whose individualistic Art Nouveau style pops up in several areas of the city. The surrealist artist Salvador Dali lived and worked all around the world, but many of his paintings depict the Catalonian landscape in northern Spain where he was born. His most famous work, “The Persistence of Memory” shows a dream-like interpretation of the passage of time. “Guernica” is one of Pablo Picasso’s most recognizable works, and is a great example of his signature Cubist style. It expresses the violence of Spanish Civil War, in particular the bombing of the city of Guernica. You can find this gigantic painting in the Reina Sofia museum in Madrid. 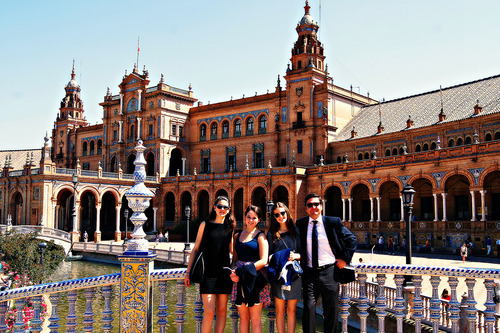 A local saying goes, “He who hasn’t seen Seville hasn’t seen wonder.” (Or in Spanish: “Quien no ha visto Sevilla, no ha visto maravilla.”) This phrase is especially true in Seville’s Plaza de España, a picturesque city square that offers a mix of Renaissance Revival and Moorish Revival architecture. The acoustic guitar is an important part of flamenco, an art-form that originated in southern Spain. In a traditional flamenco performance, a man plays the guitar while a woman dances in a bright, frilly dress. This percussion instrument is common in traditional Spanish music. A player usually holds one castanet in each hand to make a rhythmic clapping or clicking sound. In Andalucía, castanets are generally known as palillos and used in folkdances like flamenco. The Alhambra is a breathtaking palace and fortress that sits high on a hilltop in Granada. As the former home of several Moorish rulers, it offers some of the most stunning Islamic architecture in southern Spain. The Alhambra later became the royal court of the Spanish monarchs Ferdinand and Isabella. Pretty amazing, right? We told you your dreams would be full of colorful arches, eccentric modern art, and delicious fried food!